A couple of years ago, I bought a kind of plastic wardrobe from IKEA. It's called Bardu and consists of metal rods and a plastic leaf on it. It stands on three wheels. 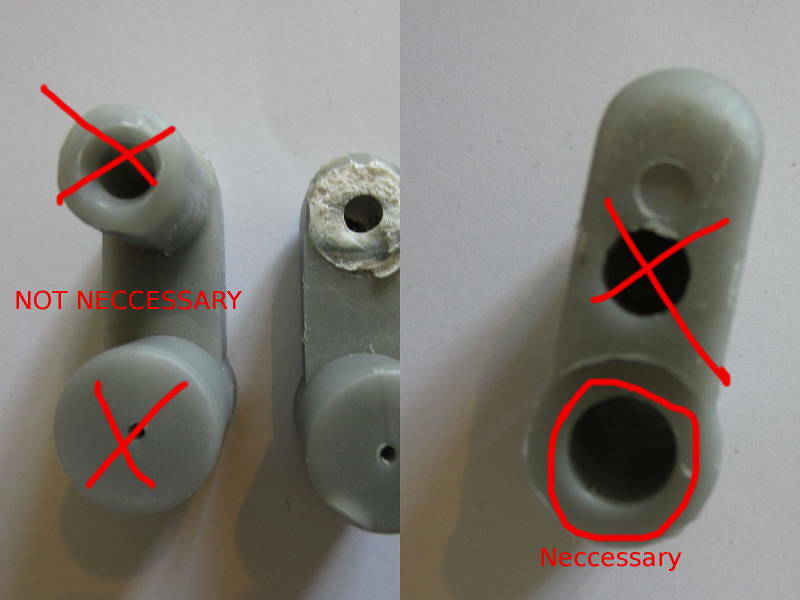 There's a small plastic connection piece between the rod and the wheels. And - you guess it - one of them is broken. IKEA is not able to ship me a replacement part. I've attached a photo of a non-broken one. 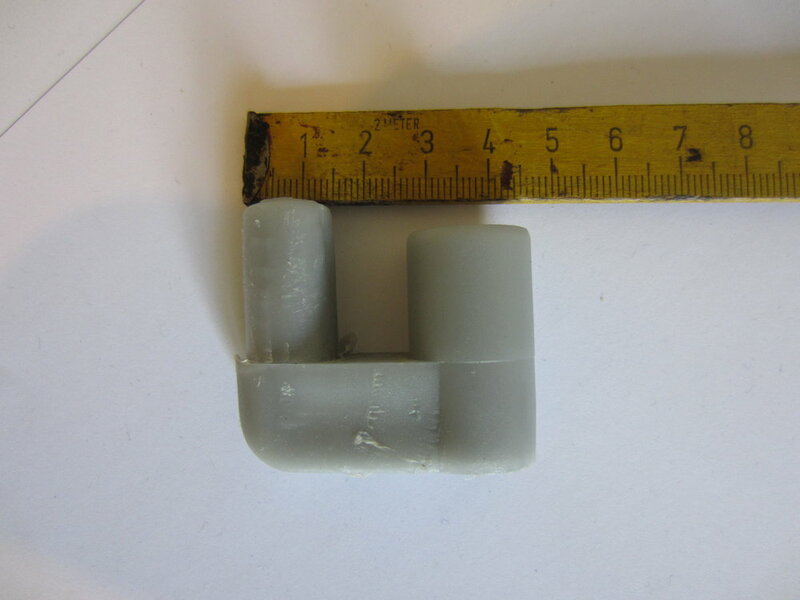 Does anyone think it is possible to recreate such a piece in a working and stable enough state with a 3D printer? Offers welcome! I'd say it can be printed, and it may be strong enough to be usable depending on the size of it. Edit : ah, www rocks, found some images. Is this the part the wheel is pushed into on image 13 here : [www.ikeafans.com] ? Edited 1 time(s). Last edit at 07/03/2012 07:11AM by DeuxVis. > Edit : ah, www rocks, found some images. Is this the part the wheel is pushed into on image 13 here : [www.ikeafans.com] ? Yes, that should be it. So the holes's wall thickness seems to be around 3 to 5 mm, that should be enough to make it strong. - measure the part yourself ? - make a 3d model of it yourself ? I could do it otherwise, it just will be longer and - for the first question - need you to send me one of the parts you have. I'm not planning on making a profit on that, will only charge you material cost and shipping - the 1st will be nearly negligible, the 2nd is depending on your location , I'm in France. Ah last detail, a picture of or a description of what happened to the broken one could help identify where we should maybe add some thickness for making it last longer. I am not near my printer, and I used a scarp of paper next to the picture of a ruler vs using my calipers, but here is a 5 minute Google sketchup STL of what might work as the Ikea part. The part I drew is not all rounded, and curved and pretty, but It should function the same. Maybe someone can take it and make it nicer. Feel free to do with this as you feel. A picture from the TOP would also be nice. @hanno: Where are you located? Thanks fredlatesta, that's a nice basis, we just need exact dimensions, add the holes and I believe make the littlest pin somewhat conical (looks like it is on the first picture). Attached find pictures from the top and the bottom. You'll also see the broken piece. My location is Berlin, Germany. DeuxVis: I'm not skilled at producing 3D models, so if I could send you the parts, that'd be great. I'd send you both the correct one and the broken (and the first you should obviously send me back if you're successful). Would be great if that'd work. I think shipping to France and back shouldn't cost that much. Send me your contact details via PM. 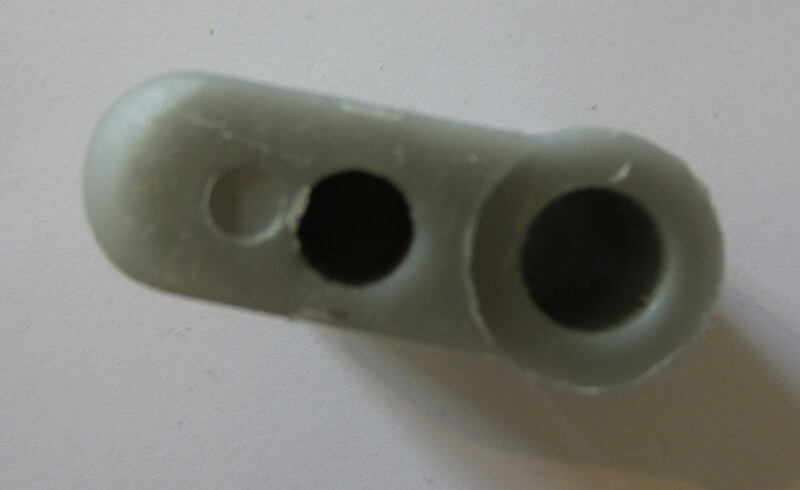 Well that's probably where a printed part would crack too, I will try and see how I can reinforce that joint. 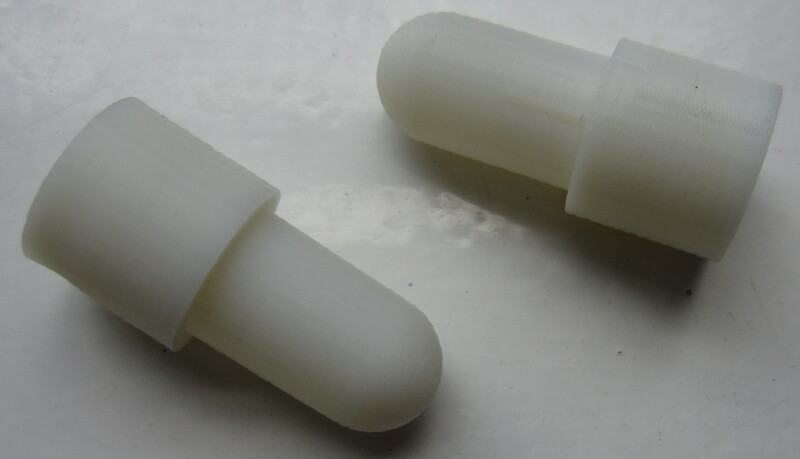 Good news is, I'm going to get some very tough plastic for printing (HIPLA from Vik Olliver) so I will probably be able to get you something much more stronger than the usual printed part. I'm reposting our private conversation about the holes in the plastic part as it might be interesting for others, too. Thanks for the reply, that's what I suspected for all those unused holes. And yes, that's a good idea to share the discussion, you can repost that in the thread if you wish. > > actually used ? > > especially the tiny ones. > > editing those to add some comments. > part is not used at all. Have done a first version, will send you a PM about mailing it back to you. Pictures - the second one is blurry, sorry, it was moving as it was taken during print, to show the "real tiny holes that actually turns into plastic pillars for internal reinforcement", in the left cylinder. I believe it won't crack at the same place as the original. Got the piece today and it fits JUST PERFECT! I'm really impressed. Re-attaching the model files here just for redundancy. Hanno, the stl is the ready to print version, with sizes similar to what I sent you. The scad file is the one you need if you want to modify the dimensions (using openscad). Your prints look great- I'm impressed! I want to build a RepRap that can produce such high quality pieces, any advice for a newbie? Sadly, I have to report that the piece broke yesterday. At the same point the original one did. Photo attached. It was looking so good... Maybe someone has suggestions how to improve stability? 1) Try to use that reinforced PLA plastic I bought from Vik Olliver some time ago, it has additives supposed to make it stronger. 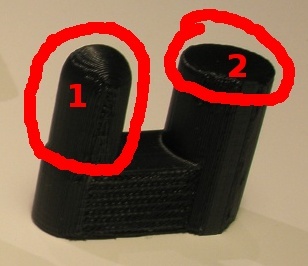 2) Try to print the part on its side. The breaking was probably helped by layers separation, so making the layers perpendicular to the forces would certainly help. 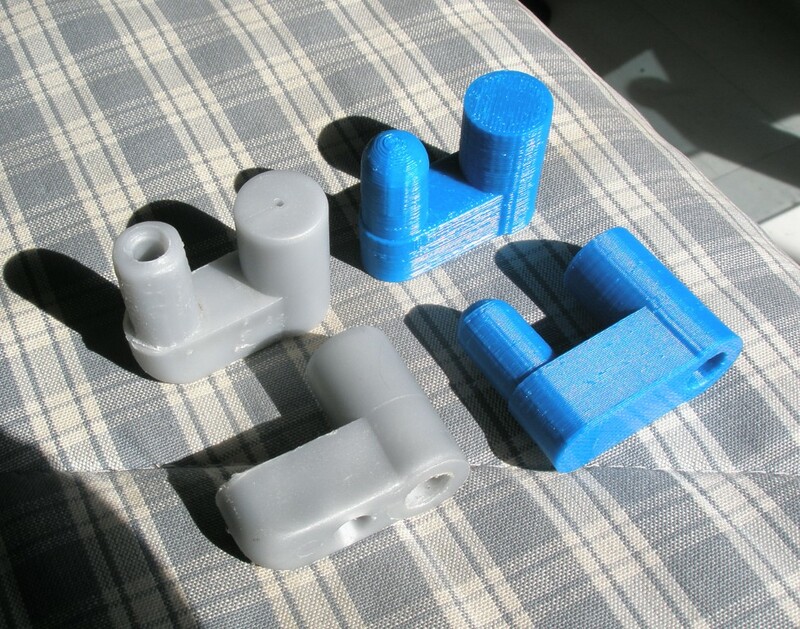 It will require support for printing then, due to overhangs. 3) I could try to make another one in ABS (like the first blue one was) and dip it quickly into acetone, then let it dry before use. I know people does this to make parts much stronger. 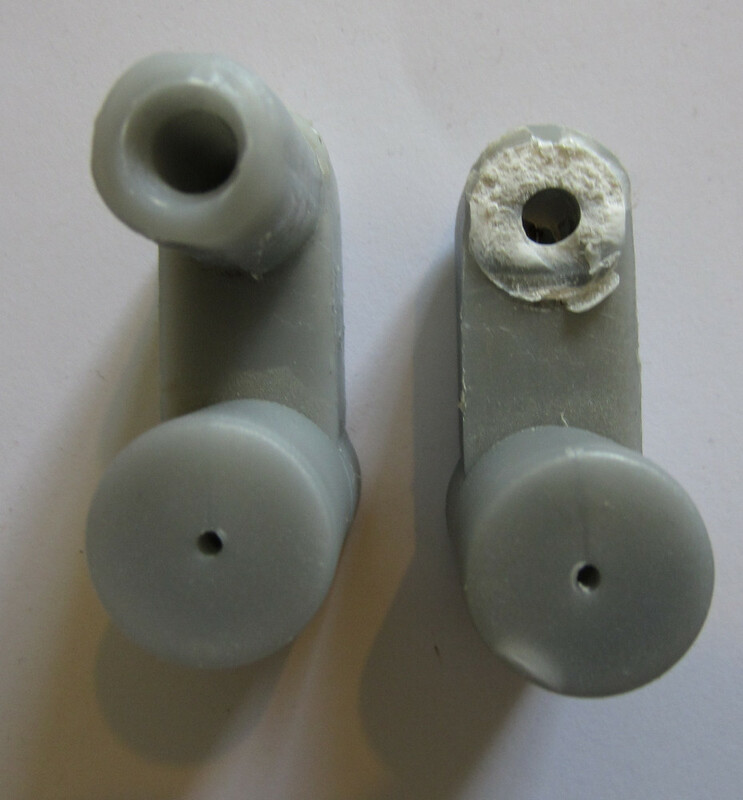 It's another way to reinforce layer adhesion, as acetone melt the plastic surface and then evaporate. Here are the new attempts. All were printed on their sides (rotated 90° around their longer dimension), so that the layers of deposited plastic are avoiding the part from breaking (it's much more easier to separate the layers than to break across them). I had to use support to print the parts in that orientation, and it proved difficult with ABS (the grey plastic here) to get the support to stick to the bed, so 2 of the parts (in the background) have warped too much and will probably not be accurate enough. You can see the support remains (horizontal lines) that might have to be sanded for the part to fit. The center shiny grey one on the picture have been dipped a couple of seconds in acetone, to better fuse the ABS layers together. Hopefully it will add to its strength. 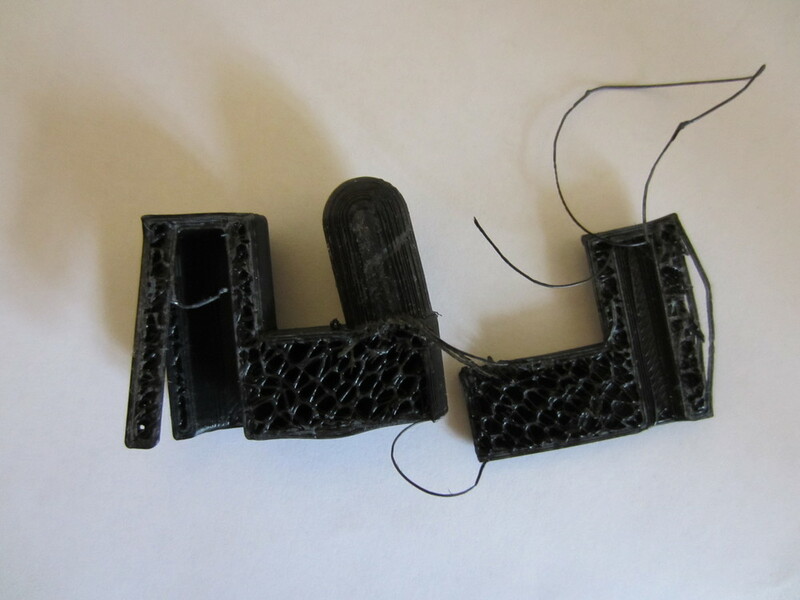 The black one is High Impact PLA from Vik Olliver (diamond age), it's a PLA with additives making it harder. Being PLA it did not warp as much as ABS and was easier to print with support. 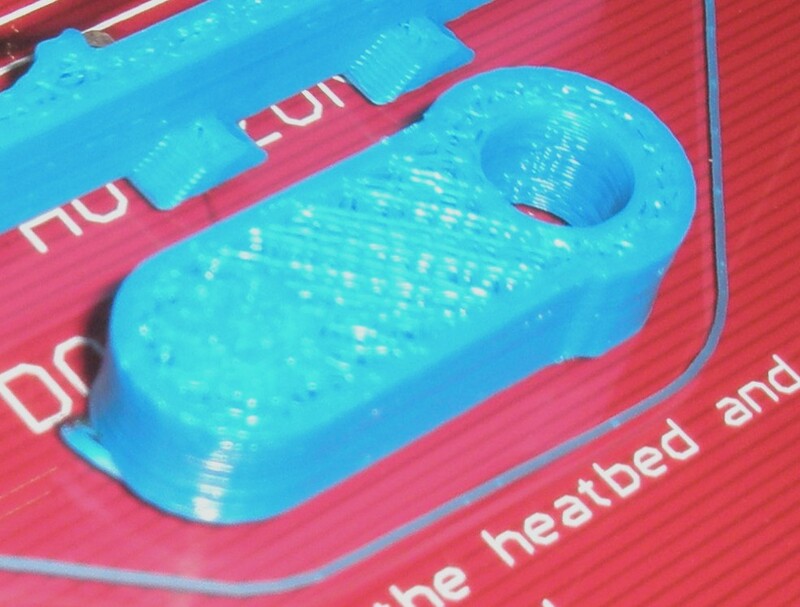 Note to people wanting to use that HIPLA : it need slower print speeds, and a fan blowing on the print, as it cool down slower than usual PLAs. It also tend to leave bits of itself in the hotend, which are getting very hard after some time spent heated in there. 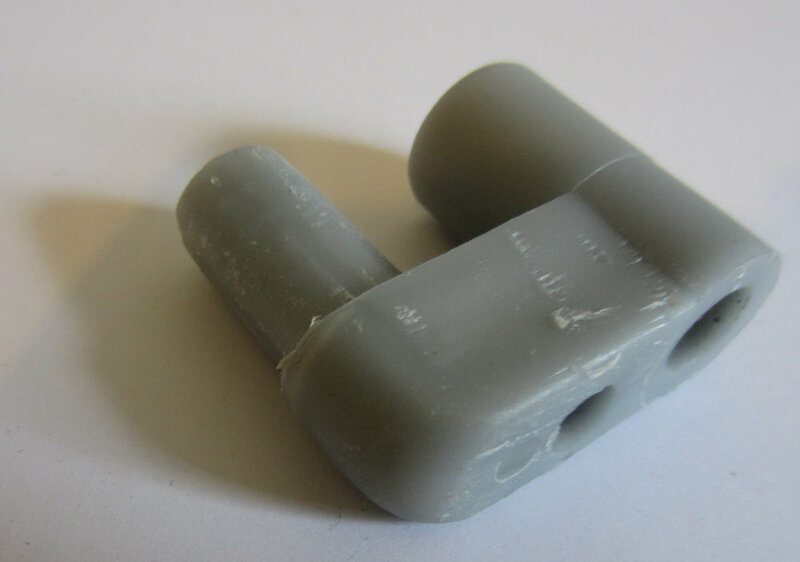 Get sure to purge your hotend with another classic PLA immediately after your print. Hanno, I will post those today or tomorrow. I used the black one now, it's fits a bit less good than the first (blue) one. The hole seems to be a little bit too big and the wheel falls out if I lift the wardrobe. Nothing serious, it doesn't affect the everyday use of the wardrobe, just transporting it is a bit more problematic. However, as you can see on the picture it's a bit skewed, so I think it may break soon. I'll use the black one for now and if it (or one of the others) break I'll test the grey ones. Anyway, DeuxVis, thanks a lot again for your help. Edited 1 time(s). Last edit at 11/26/2012 02:35PM by hanno. Seeing your picture makes me think the next move would be to redesign the part so that the wheel axis is aligned with the tube - avoiding overhang and flexing. That would probably require to change all the parts at once then, as it would lift the wardrobe up a bit. This might work, but maybe that'd be the point to say it's not worth any more as the effort exceeds the value of the whole wardrobe. But anyway: it "worksforme" now and as you've send me a number of replacement parts, even if it breaks again I have replacements for some time now :-) I'll keep you updated if anything happens. Well it wouldn't be very complicated regarding design, just cutting off bit 1 and sticking it on the top of 2, and removing the unneeded horizontal remains. Crack... The next one. The black piece you sent me broke, this time at another point. I've replaced it with one of the grey ones. This seems to fit much better than the black one. 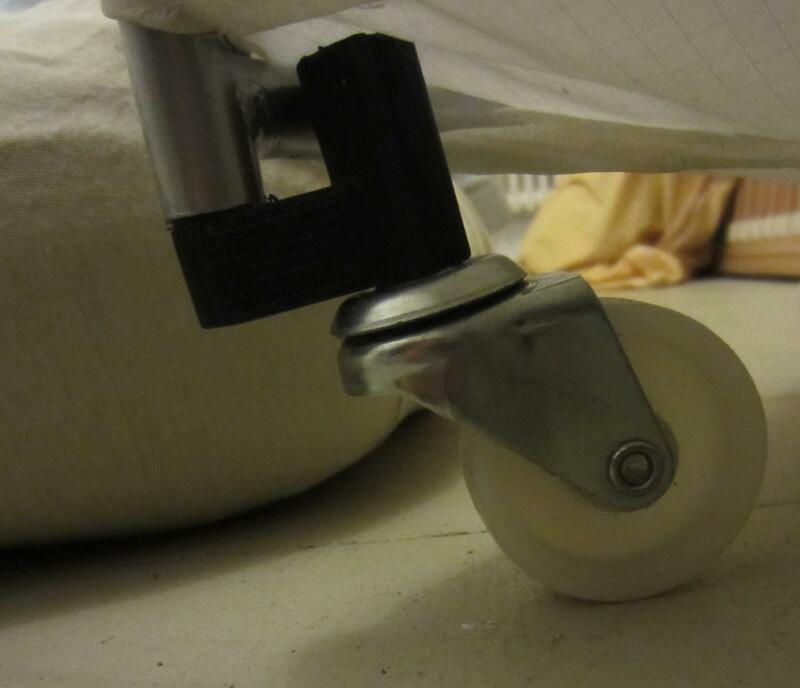 It's not as askew as the black one and the wheel part fits in much better (doesn't fall out if I lift it). Obviously it should be printed with 100% fill! Mmm yeah Bob, 100% infill might help with layer adhesion, but it will also avoid the flexing. Hanno, I'm not too surprised by the black one cracking open like this, I still have to improve my print settings for that plastic. Let us know how the grey (ABS) one does. I think I should post an update here. For two years I used all the pieces DeuxVis sent me and all of them cracked sooner or later. Recently I had used up all of them and contacted him again. Instead of re-printing the same object we now decided to redesign it. 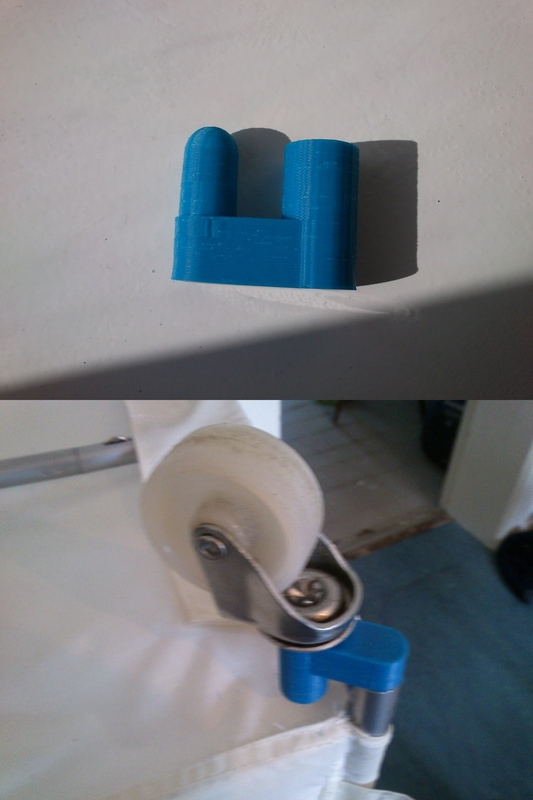 With this new variant the rod of the wheel directly goes into the wardrobe. I think it is unlikely that this variant will ever crack, I don't see how it could.